The St James' Tour enables website visitors to browse through the various sights that St James' has to offer, the tour takes visitors from in and around St James' grounds to inside the church itself. 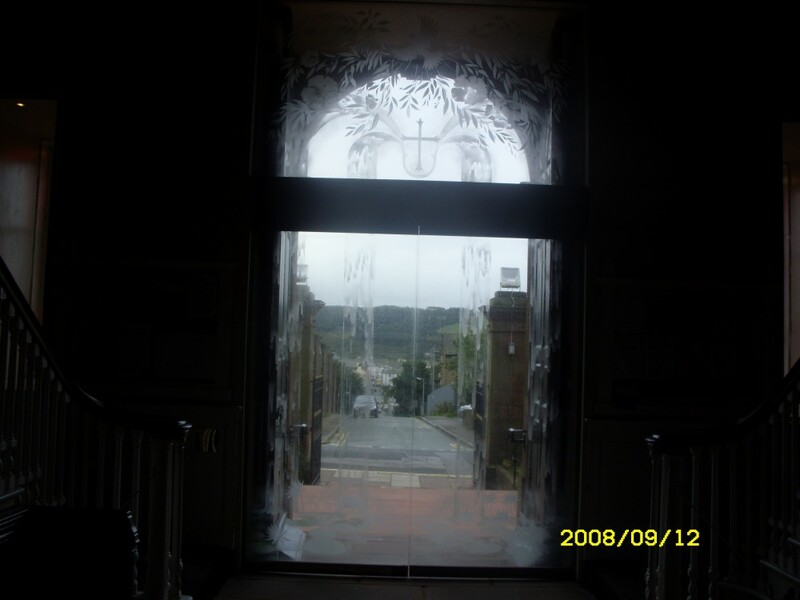 I hope you find the tour interesting and informative, although this is just a peek at what St James' has to offer, so why not pay us a visit to see St James' Church and the wonderful surroundings of Whitehaven for yourself! The Church is open for Visitors from 9 am to 4 pm Monday & Wednesday to Saturday, 11.00 am to 4 pm Tuesday, and 12 noon to 4.30 pm on Sunday, subject to service requirements. 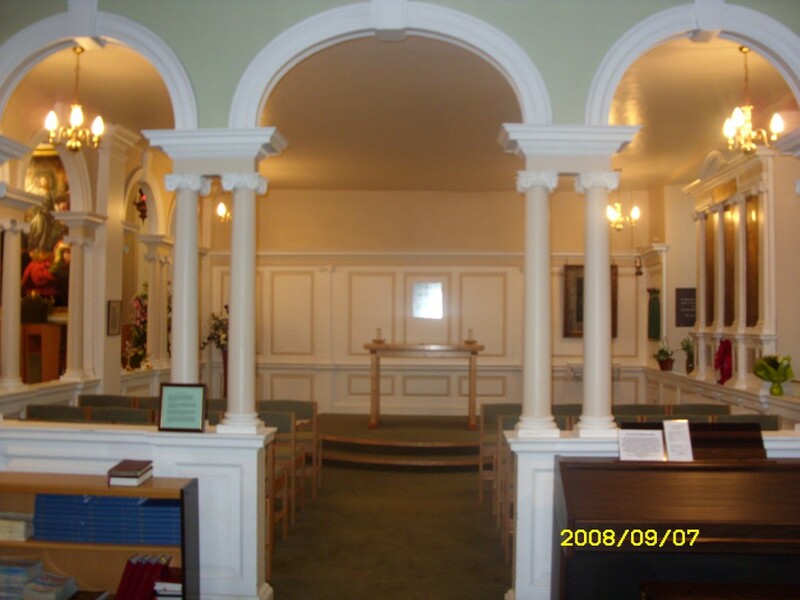 There are information leaflets available in church, and also interpretative cards at various of the features. The Pulpit- This has only been in it's present position since 1886. 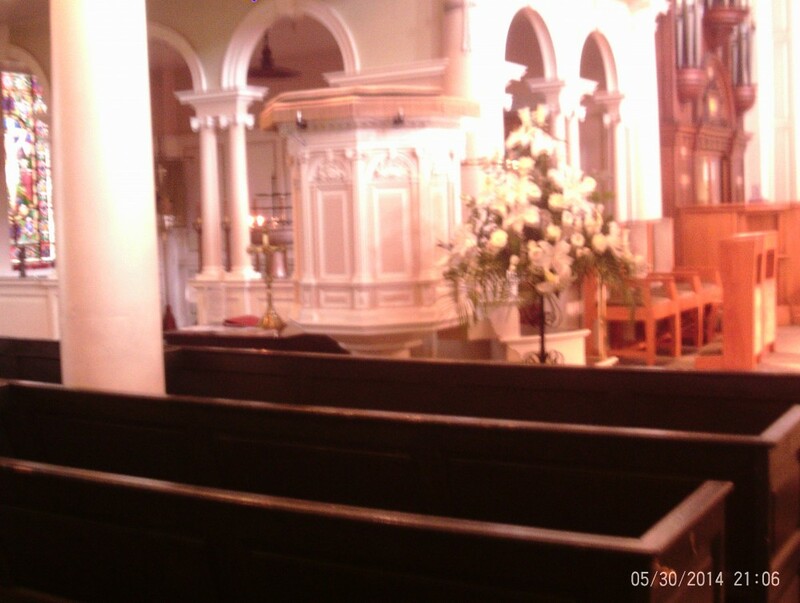 Prior to this it was where the organ is now sited, and before this stood in the Apse where the Altar now stands. 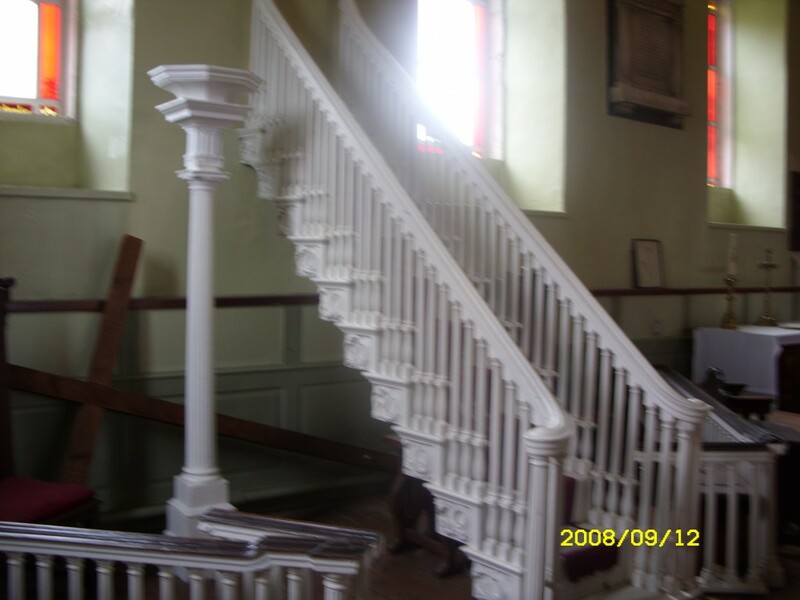 Originally a three decker wineglass style pulpit the lower two decks (readers and clerks desks) were removed in 1865, and the pulpit was moved to where the organ is now. In 1886 the pulpit was removed to its current position. Finally in 1979/1980 it was lowered from gallery level to its current height. The stem and steps were removed but can still be seen on the south gallery. For guided tours there are photographs available of how it was. The Ceiling-There are two ceiling roundels in the Church. One depicting The Annunciation, and the other which is nearest to the Altar, is of The Ascension. 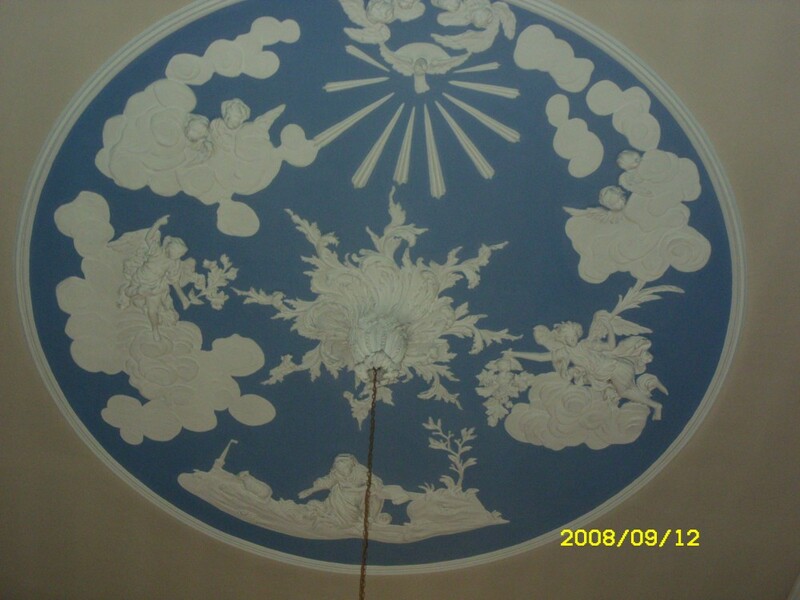 During the redecoration of the Church in 1970 the roundels were given a Wedgewood appearance that made the off- white plaster stand out in relief against the blue background. For the last century they have been believed to be the work of the Italian artists Giuseppe Artari and Giovanni Battista Bagutti. (In fact they were Swiss and Bagutti had died by 1752/3). However recent academic studies have shown that they are important examples of the work of the Irish stuccodore Christopher West. We know that they cost £23/17/4. 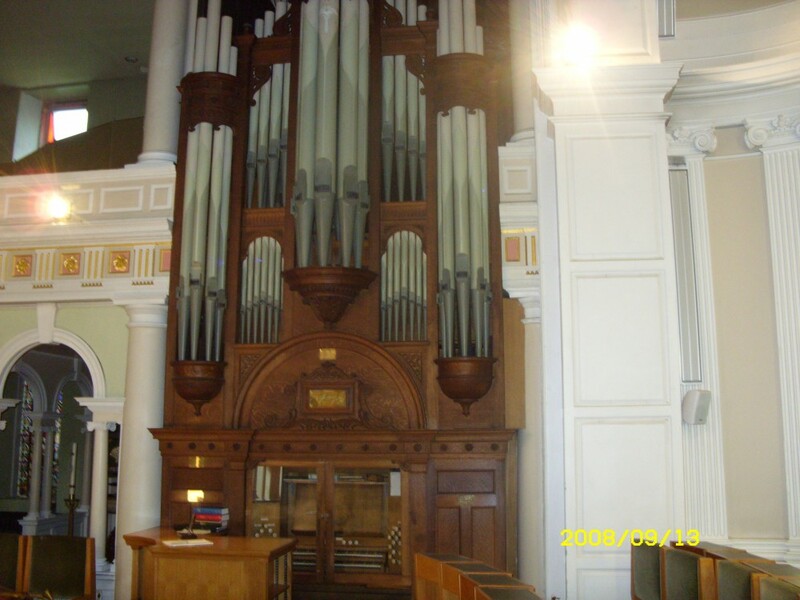 The organ is relatively new as it dates from 1909 and was built in London by Norman & Beard Ltd to a design by Lt Col G.Dixon of St Bees, and has always been in its current location . The first organ (purchased in 1818) was upstairs in the west gallery, but was moved to where the current organ is in 1886. The Font is made of Florentine marble circa 1650 and comes from Duomo, Florence. Records show that it was presented to the church in 1876 in memory of Elizabeth, second daughter of the Earl of Lonsdale. 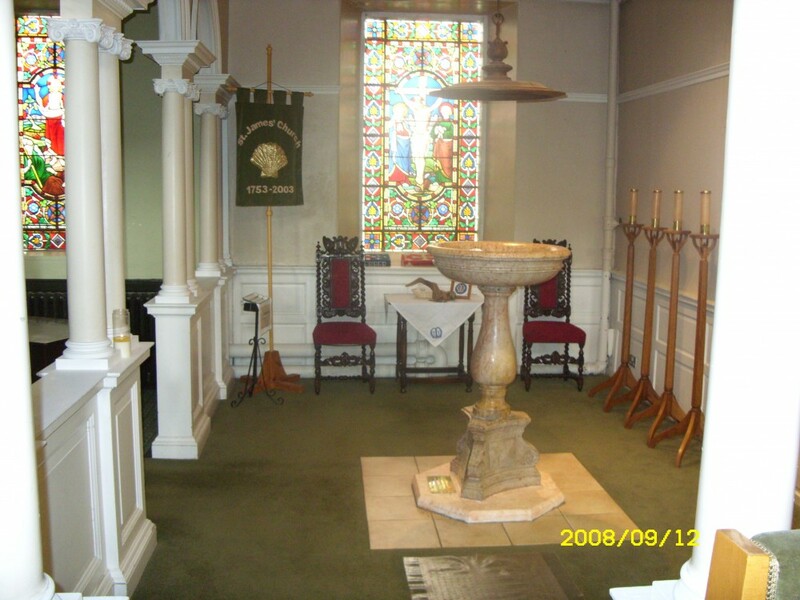 The Memorial (or Lady) Chapel- is a recess converted in 1922, after the removal of the pews, to form the church’s war memorial. 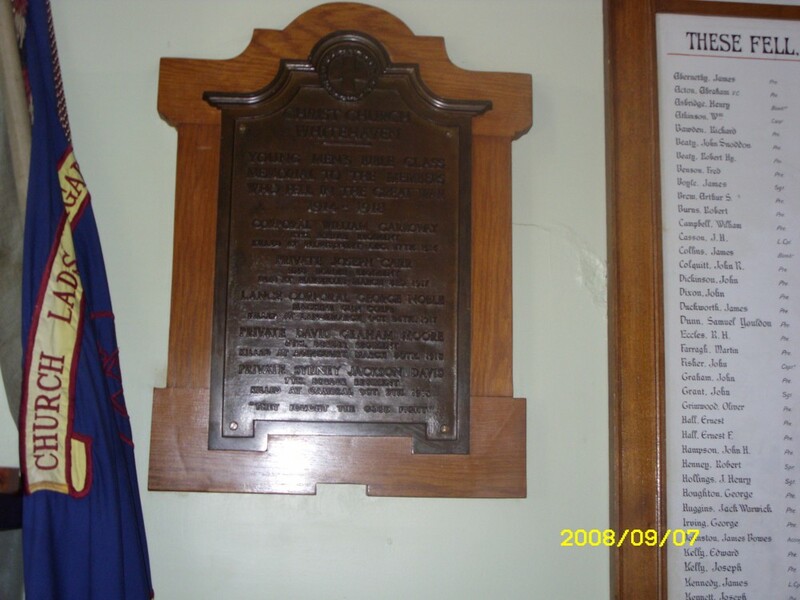 It houses three bronze tablets on which are engraved in black lettering the names and units of those servicemen lost in the 1914-18 war. On the eastern window ledge is a lump of coal and an illuminated scroll (on the wall) with the names of all 104 men who lost their lives in the 1947 William Pit Disaster. Hanging up is a miner's lamp, converted to an aumbry lamp. 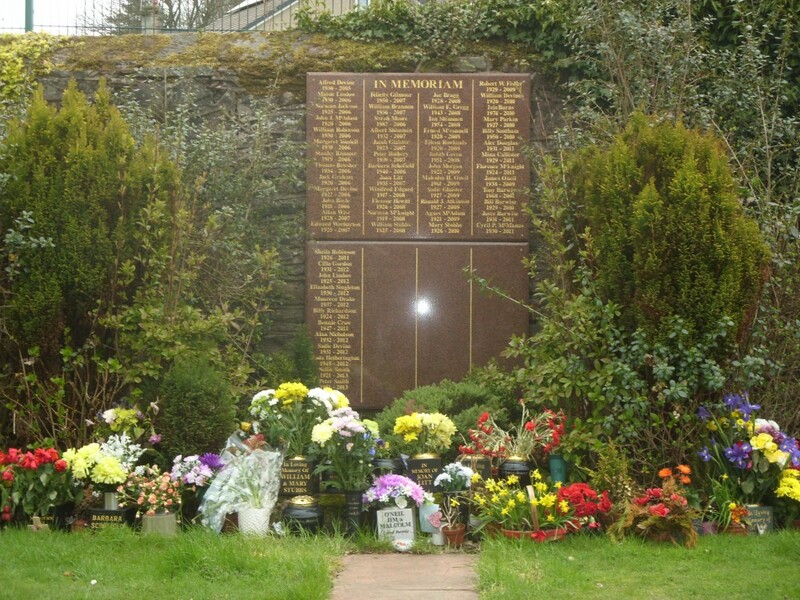 These were presented to the church as a memorial to the coal miners who lost their lives in the William pit disaster in 1947. The Lamp was given by the Mine Manager for pastoral services rendered. This part of the Church as now been refurbished and this gives the Lady Chapel a more modern, brighter appearance without looking out of place with the rest of the church. The baptistry has also undergone a make over, so the changes to both sides of the church create a nicely balanced look to the church. 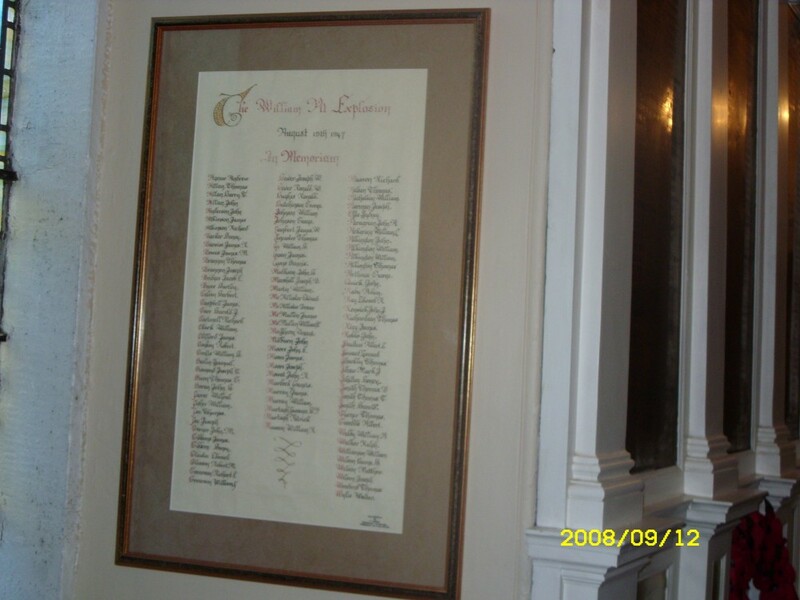 There is also a Book of Remembrance in the chapel for those whose ashes are interred in the Churchyard. 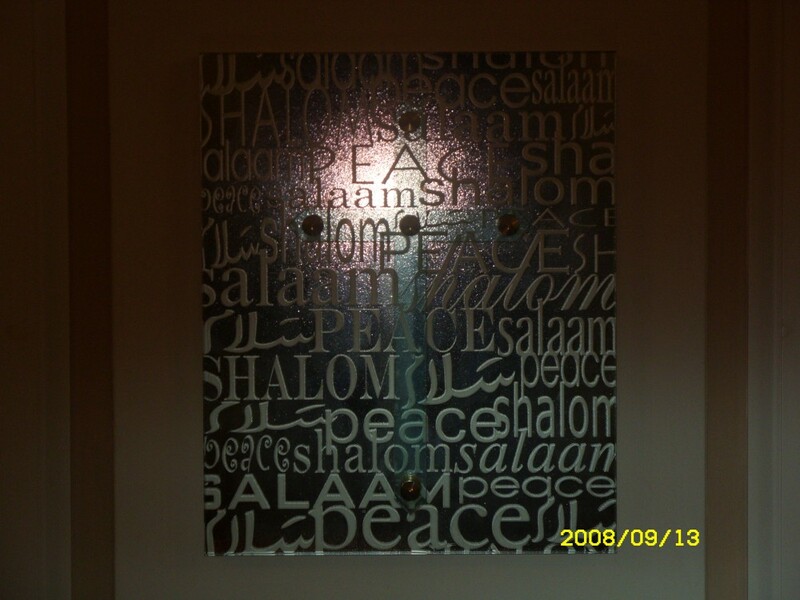 The Glass Peace Cross-This is behind the Altar in the Chapel. This was the work of Sixth Form Art Students at St Benedicts Roman Catholic High School, Whitehaven, under the guidance of local Artist, Graham Jones. It was in response to the events in New York on 11th September 2001. The background is engraved with the word for peace in the three monotheistic world faiths, superimposed with the Cross of Christ. Its symbolism contains the hope that peace should be the fruit of all world faiths. For the Christian Faith that peace is foundand expressed in the reconciling and unconditional love that God offers to his people through the cross of Jesus as saviour of the world. The Clock-A clock made by a local blacksmith, Thomas Lindal of Whingill, Whitehaven at a cost of thirty guineas was installed in 1754 as an engraved brass plate shews. The plate bears the names of C. Spedding and P.Peele and Thomas Lindal, Whingill. A sailcloth tarpaulin cover was later made for the clock face.. This clock functioned for 118 years but in 1943 was superseded by a remodelled clock (formerly at the Silversmith’s Company, London) by Potts & Sons, Leeds at a cost of £100. It was intended to have an electrical striking mechanism fitted, but this has not yet been done. A quote was obtained in 1950 which was deemed to be unaffordable. A fundraising week was held between 6th & 12th September 1943, which raised £155/10/10. In 2014 an auto-winding mechanism and auto-regulator was fitted-to automatically change the clock at the beginning and end of British Summer time. 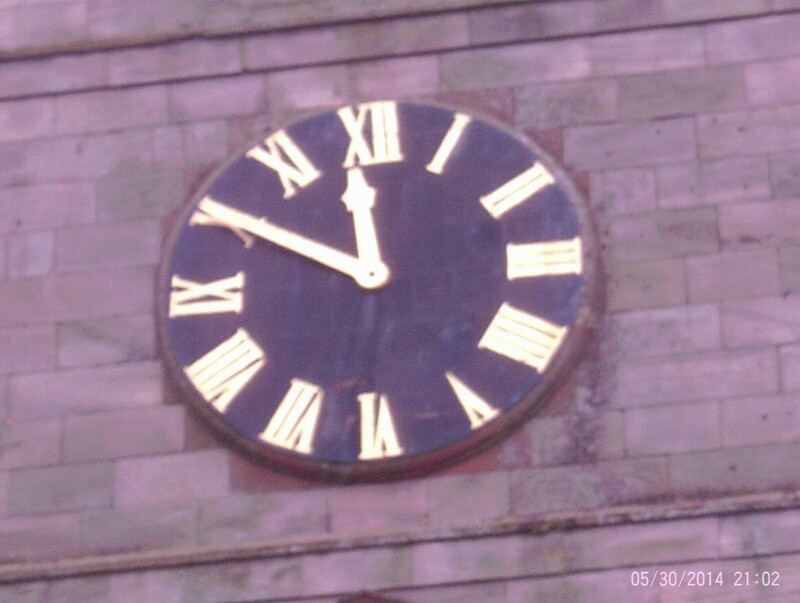 The story of how this clock was obtained is supposedly that the then Vicar was caught in the rain in Leeds. A van stopped and offered him a lift. It was driven by a Ron Dove, a fitter for Potts of Leeds and a well known bell-ringer. In the course of the conversation the Vicar mentioned that the clock was out of order, and Ron Dove said that Potts had a rescued clock from the bombed out Silversmiths company building- would we like it? The original clock was ’one-handed’. In March 1753 a bell of about 20 cwts was purchased from Thomas Mears of Whitechapel, London at a cost of £149 3s 9½d. ; the freight charge from London was £2. 7s. 7d. This bell did not prove to be satisfactory over the years, and in 1812 another bell, weighing 21 cwts, 14 lbs., was purchased from Thomas Mears & Co. London at a cost of £219. 8s. 2d plus £10. 10s. 9d for insurance and cartage. Freight charge from London was £3. Part of the old bell, 11cwts, 3 qrs, 17lbs at 15p.p. was sold to Thomas Mears & Co., for £83. 6s. 3d., with a set off of £1. 16s. 6d for freight to London, wharfage and cartage. In 1842 the second bell was recast by Thomas Mears & Co., of London at a cost of 13 pence per pound for a weight of 22 cwts. 1 qr. 15 lbs. A rigger was paid £2. 3s. 10d, for taking down and hanging the bell and insurance on the bell was 16s. 4d to and 16s. 8d from London. Weighing the bell for shipment was 3d. and the Bill of Lading charge 1s. 1½d. This bell now forms Bells 3, 4 and 5 in the modern peal. With its massive tower St. James Church had long suggested a peal of bells. However this did not come about until 1978 when a peal of 10 bells was created, supplemented to 12 in 1998 (although a subscription list to provide funds for a peal was mooted as far back as 1775), whereas its neighbours Hensingham St. John’s and Cleator Moor St. John’s long had fine peals. It was once a source of comment in the town with the clashing of the St. James’s and Holy Trinity bells toned in E and the St. Nicholas’ bell toned in F.
The Church now has a fine peal of 12 bells- full details of which are given below. This peal is the same size as that of St. Paul’s Cathedral, London. 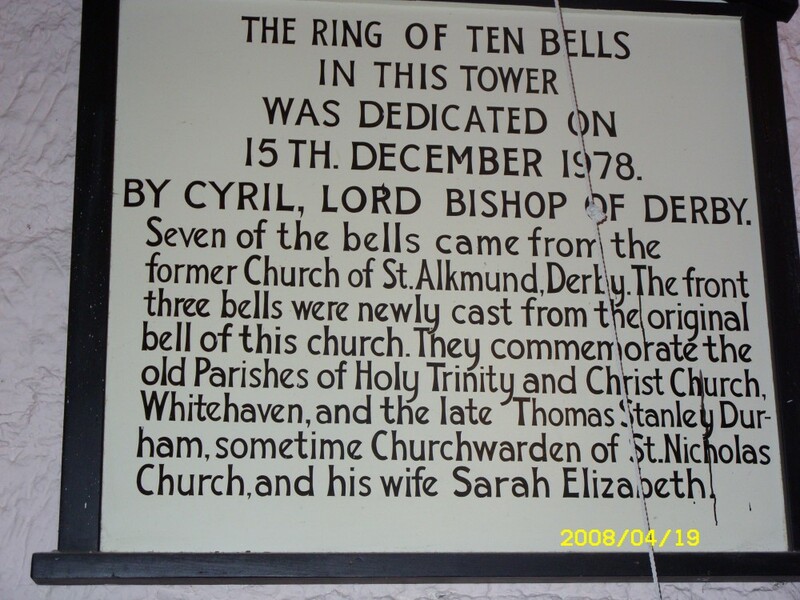 The number 6 to 12 bells were originally in the Church of St. Alkmund, Derby and were rededicated here on the 15th December 1978 by Cyril, Lord Bishop of Derby. The Garden of Remembrance-The two Gardens of Remembrance are situated behind the church. 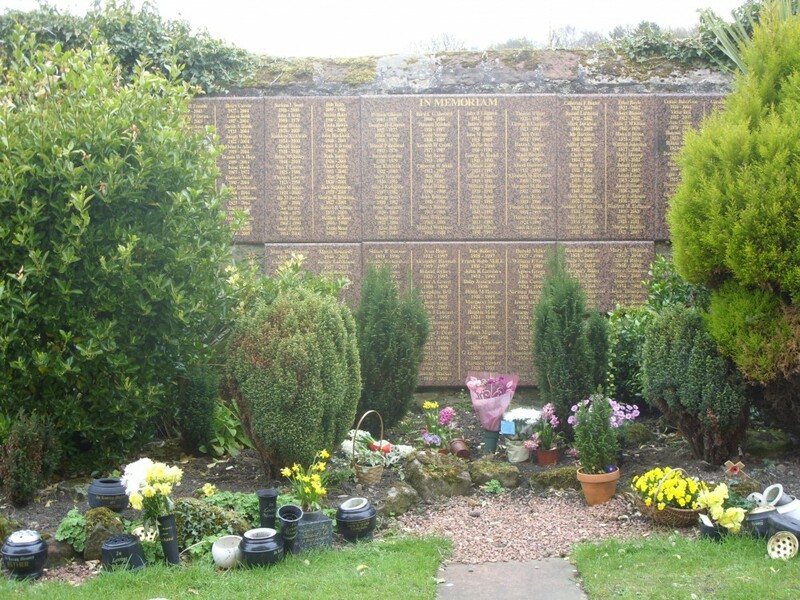 On the wall overlooking them are marble tablets engraved with the names of those whose ashes are interred there. 2 of them are late 19th century, by Wiliam Wailes, the remainder are 20th century: Three by Shrigley and Hunt, Four by Abbots, One important window by Leonard Evett, and the Millennium Window, by Alex Haynes & Albion Glass of Brampton, which is in the Contemporary Style. 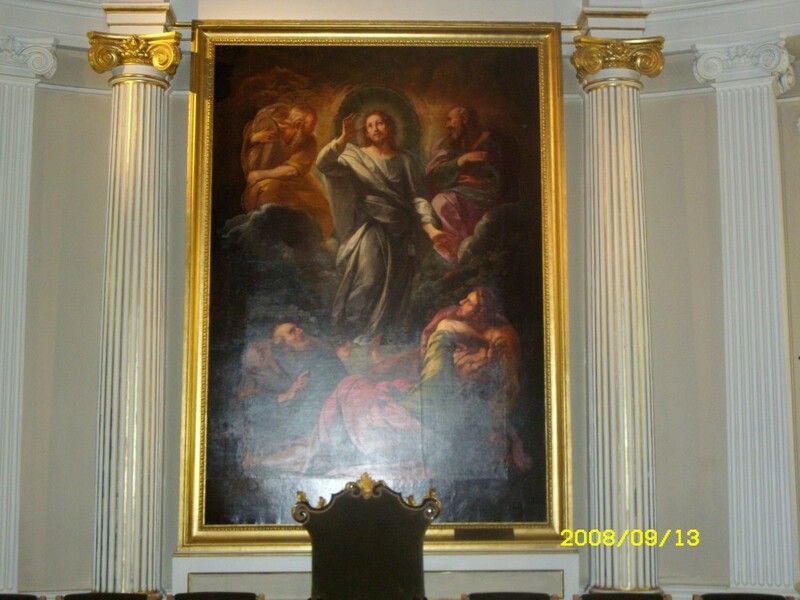 The Altar Picture-The Altar picture is a work by the Italian artist Giulio Cesare Procaccini and portrays "The Transfiguration". The history of this painting is strange as it was said to have been taken from the Escoril Palace in Madrid by Napoleon's soldiers during their invasion of Spain. From there it was taken to France and then to England, where it eventually came into the possession of the Third Lord of Lonsdale. 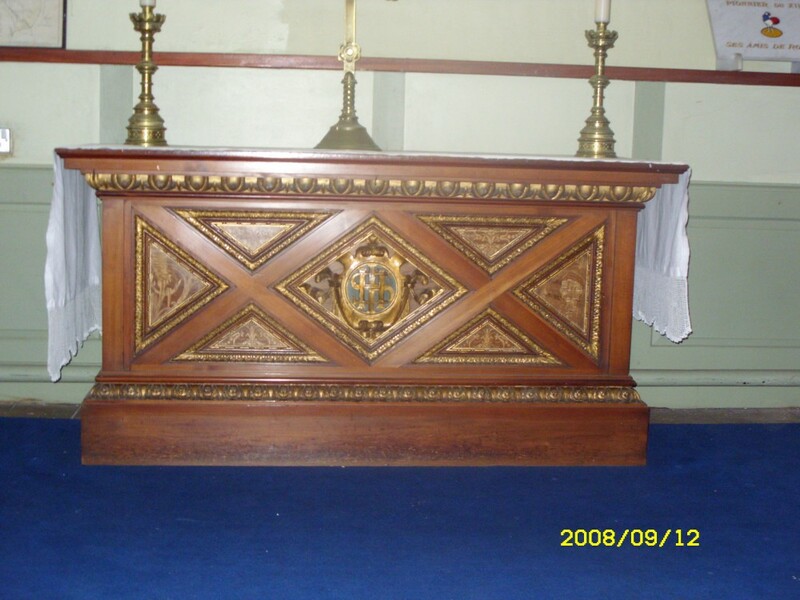 In 1869 he presented it to St James Church. This painting, reputedly the only work by this Italian artist in any English Church, shows the transfigurated Lord and the disciples Peter, James, and John. In the top left corner can be seen Moses holding the tablets of Law, while the top right corner shows Elijah. The Porch-The porch is quite plain with a flagged floor and an oak staircase on each side leading to the upper galleries . 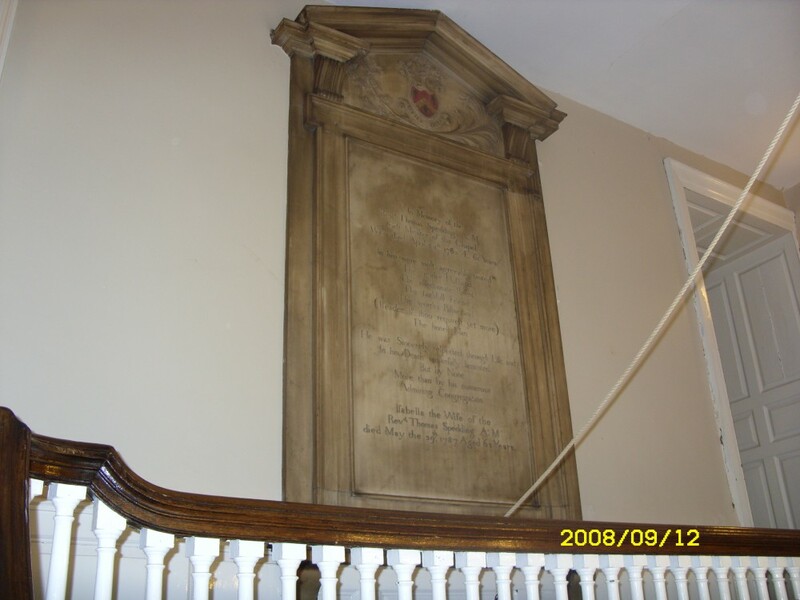 On the wall at the head of the stairs is a carved monument in memory of the Reverend Thomas Spedding A.M. who was the first minister of the chapel and who died in 1783. 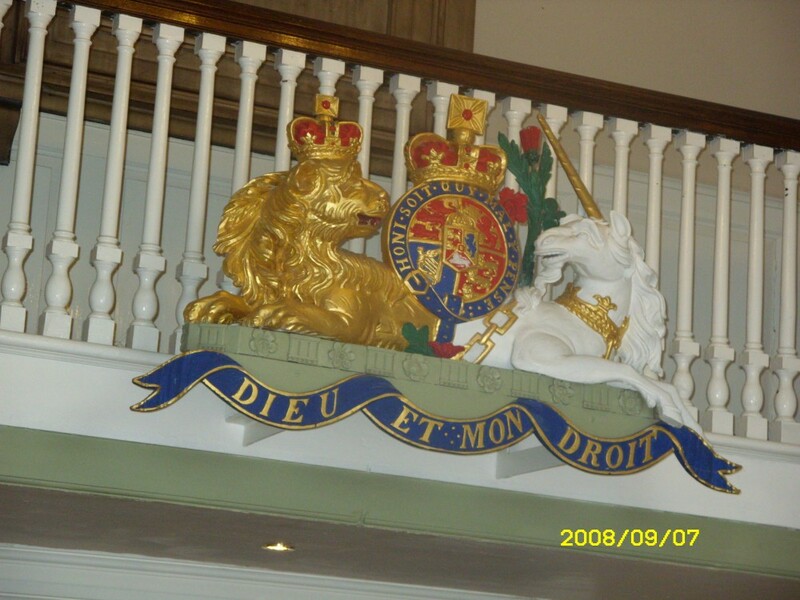 Fastened to the landing above the entrance doors to the church is the carved and painted Royal Hanoverian Arms of the Third period (1816-1837). Before you leave please go up to the galleries, where you get a totally different view of the Church. The west gallery still has its tiered seating but most of those seats had to be removed from the other galleries in 1980. 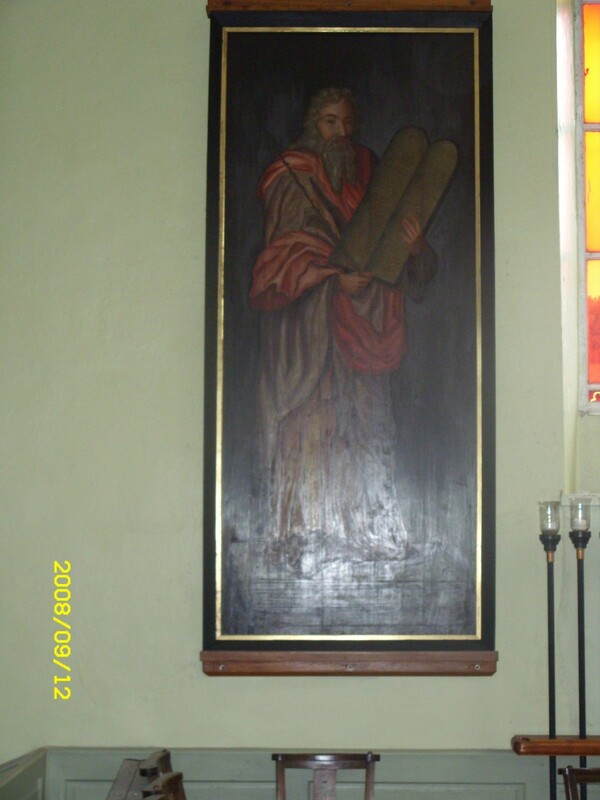 Moses stands on the left and holds the tablets, depicted as long and rounded at the top, in his left hand. On one can be read Exodus, and on the other is an attempt to show the title in Greek or Aramaic. The text is simulated writing and not decipherable. In his right hand he holds a twig or rod with buds. He is shown with flowing grey hair and beard standing on a pedestal against a dark brown background. Over his yellow undergarment there is a sandy brown cloak with a red scarf. Against a dark brown background Aaron stands out in equally vibrant colours. He has a reddish brown beard and wears a gold brown mitre. Correctly speaking he should be wearing a double shaped hat. He has an ornate red chasuble and a red kingquare over a white cassock. The lower edge of his upper garment has golden tassels suspended from it. He also stands on a pedestal. A great breastplate in a gold frame the Urim & Thummin hangs from a chain round his neck. The brightly painted ‘jerkin’ over his ‘surplice’ is in red, gold and blue and is probably intended to show embroidery but it is hard to decide what materials are depicted because of constant retouching over the last 260 years. Matthias Read was born at Clerkenwell, London in 1669. He arrived at Whitehaven in 1690 as a pupil of Jan Van Wyck on his way home from service at the Battle of the Boyne. He appears to have settled because Van Wyck found work with the Lowther family. In 1713 he built a house at 5 Cross Street (now Read Guest House). He married Elizabeth Hinde on 17th May 1702, in the 1st St. Nicholas Chapel. This stood in what is now the middle of Lowther Street outside The Pack Horse Inn. He painted the Altar Piece (The Last Supper) at St. Nicholas in 1713- lost in the fire of 1971. 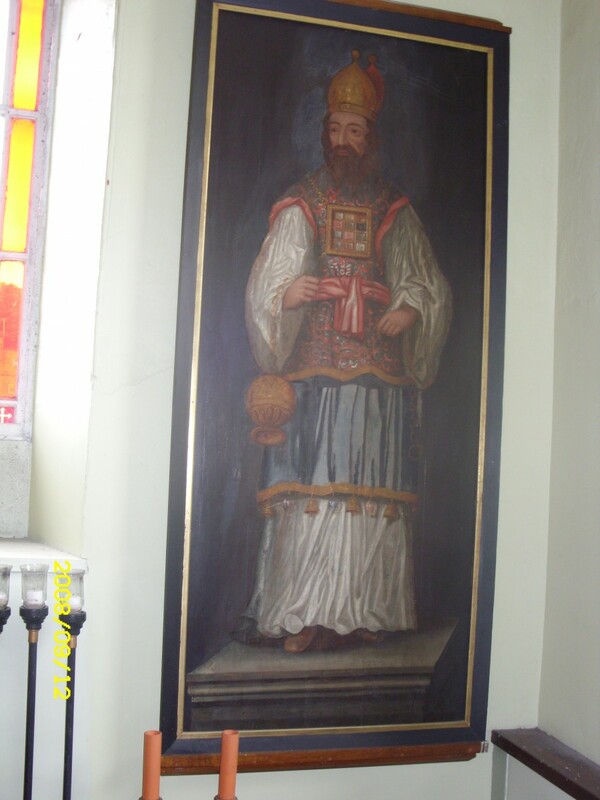 He also painted the Altar Piece (The Ascension) for Holy Trinity Church (destroyed by fire 31st August 1871), decorated Seats, painted the Royal Coat of Arms and subscribed £10 to the building of that church. The north side is now empty, but the south gallery has various redundant altars and other furniture from our other former churches in the town, together with the other steps and pillar to the pulpit, which raised it to gallery level until 1980 (THESE ARE NOT SAFE TO ASCEND), also the War Memorials from Holy Trinity Church (closed 1949) and the former Whitehaven County Secondary/Grammar School which was in town until it became Whitehaven School in the 1970's and moved to its current site at Hensingham. There are other surprises up here as well, and there is interpretative material there also. 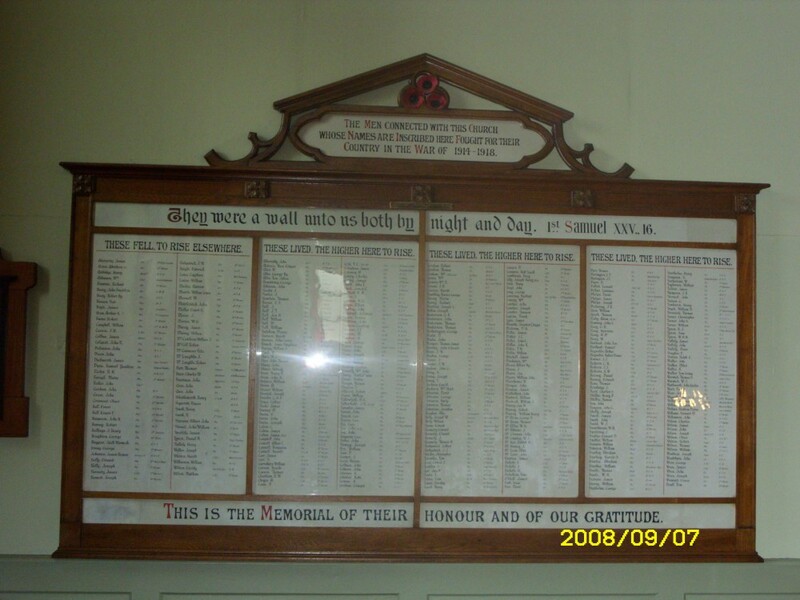 For details of those on the school war memorials see separate page on this guided tour. Private Carr (11616) had enlisted with the 6th Battalion Border Regiment on 31st August 1914. His first posting was to the Dardanelles where he arrived on 18th July 1915. He was wounded in the face on 9th August 1915, and treated at the Aberdeen Military Hospital. He went back to France on 8th April 1916, now with the 2nd Battalion. He sustained injuries on 16th May 1916, and was invalided to Marseilles where he was given a false jaw and teeth. He died of lobar pneumonia at 0805 on 3rd March 1917, at the age of 20, and was buried on 5th March in the St. Pierre Cemetery, Marseilles. He is now in Grave IV A2 of the Mazargues War Cemetery, Marseille, 6 km south of the city centre. There are 1,765 men buried here. His older brother, George, had been previously wounded, and totally incapacitated. Joseph lived at 37 South Row, Kells, the son of William & Frances Ann Carr. He had been baptised at Christ Church on 21st May 1896. His father (a miner of 6 Monkwray Cottages) died on 11th September 1927 aged 71, and his mother on 4th February 1945 aged 84. He is also commemorated on the family gravestone 5C20 in Whitehaven Cemetery. Private Davis (14415) of the 7th Battalion (The Westmorland & Cumberland Yeomanry) Border Regiment was killed at Cambrai on 9th October 1918, aged 24. He is buried in plot IIIE4 of the Naves Communal Cemetry Extension, which is 5 km North East of Cambrai. Around 450 men are buried there, concentrated from other cemeteries and battlefield graves. He was the son of Joseph & Margaret Ann, of 14 Preston Street. He had been baptised at Christ Church on 27th June 1894. He had been employed at Lowca foundry before joining up, and was a founder member of the Bible Class. Corporal Garroway (14448) of the 8th Border Regiment died of his wounds (sustained at Ploegstreet on the 26th) at the 8th Casualty Clearing Station, France on 27th December 1916, aged 25. He had been one of the “Pals” Regiment, formed in September 1914 (see the St James Memorial pages for full details). He is buried in Grave IIIA50 of Bailleul Communal Cemetery Extension (Nord), France near the Belgian border, 14km SW of Ypres, where 4,403 men are buried. He was time served as an iron moulder at the Newtown Foundry and was a well known athlete, footballer and bowler. He also had a sister and brother. There is a photograph of him on page 7 of the “News” dated 18th January 1917. He was the son of John and the late Sarah Garroway of the Anchor Vaults Public House in Ginns. 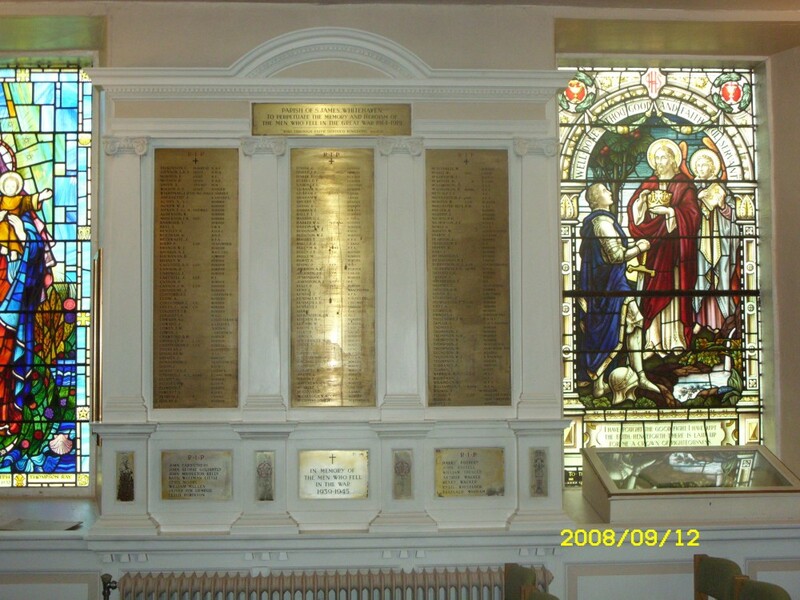 A memorial service for him was held at Christ Church on 14th January 1917. He had been baptised at Christ Church on 12th July 1891. 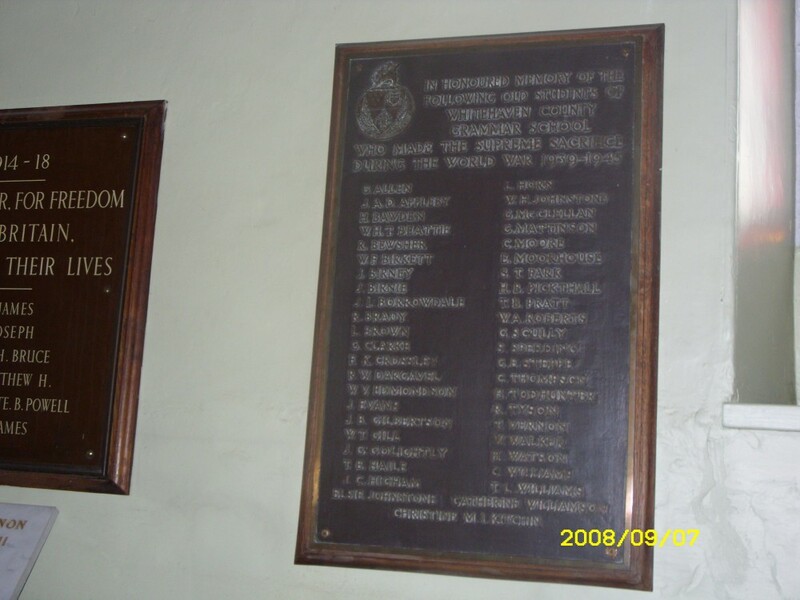 He is also commemorated on the Oddfellows Society Roll of Honour. Private Moore (241191) of the 5th Border Regiment died of wounds at Agincourt on 30th March 1918, at the age of 23. He has no known grave but is remembered on Panel 46 of the Pozieres Memorial. He was the son of Joseph B & Dinah Ann Moore (nee Jolly) of 6 Preston Street. He had been baptised at Christ Church on 13th January 1895, and had worked in his father’s joinery business on Preston Street. 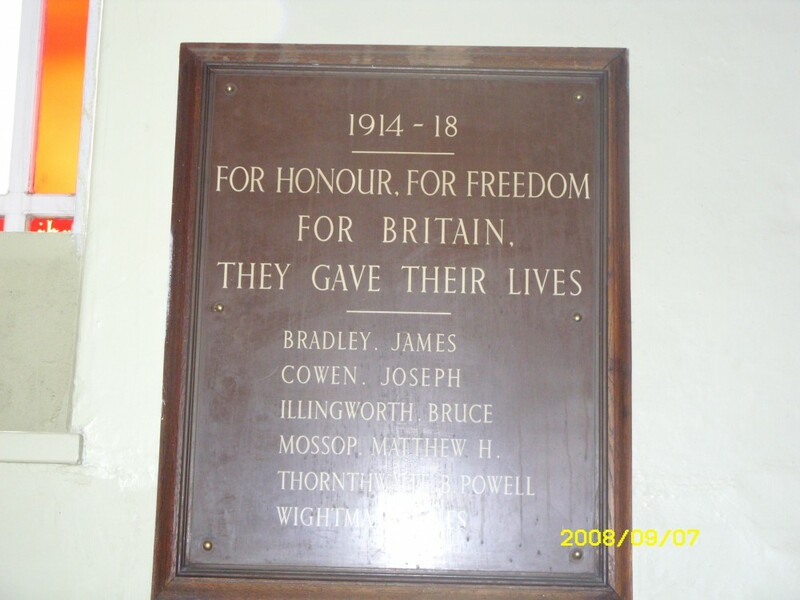 His brother, John George Moore had died in 1917, and a memorial service was held for him at Christ Church on 22nd July 1917. He is not on any town war memorial, but see Holy Trinity Additional Casualty 85. He is also remembered on the family gravestone 5H18 at Whitehaven Cemetery. Lance Corporal Noble (58664) died instantly of shrapnel wounds at Langemarch on Oct 24th 1917, at the age of 26. He had enlisted in the Royal Field Artillery on 2nd May 1916, later transferred to the Northumberland Fusiliers, and then to the 170th company of the Machine Gun Corps. He is buried in Grave III D19 of the Cement House Cemetery in Langemarch, which is North of Ypres. There are 3,592 men buried here- a concentration from other cemeteries and battlefield graves. As well as belonging to the Bible Class, he was also a sidesman at Christ Church. A memorial service was held for him there on Sunday 11th November. He lived at 19 Brackenthwaite, and was a miller at Pattinson’s Beacon Mills. He had a younger brother, William, also serving in the Forces (Private 24264 of 2nd Dorset in India at the time of George’s death), and was the son of George & Fanny Noble. He had been baptised at Christ Church on 21st June 1891. His father died on 15th May 1926 aged 68, and his mother on 8th February 1932 aged 72. He also had a sister, Edith, who died on 9th January 1932 aged 46. His name is also on the St. James Memorial. He is additionally commemorated on the family gravestone 5A27 at Whitehaven Cemetery. Note- the Bible Class met at 2.30 every Sunday afternoon in the Temperance Rooms. 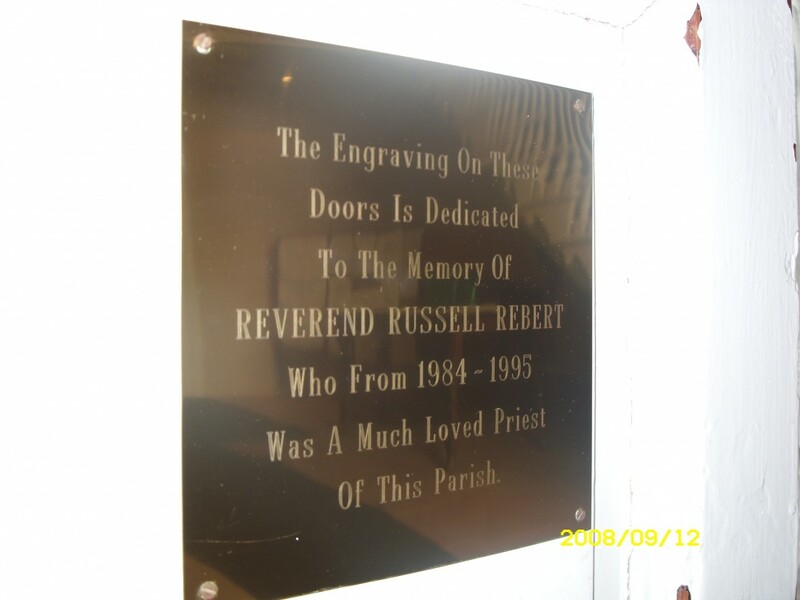 When the inner doors were made it was decided to have them engraved with designs that were associated with Sri Lanka in memory of Russell Rebert who died in 1995. He came to Whitehaven in 1984 as Curate, and later became Team Vicar and Hospital Chaplain to the Parish of Whitehaven. After a long illness he died in his native Sri Lanka aged 48. The design on these doors incorporates the two national symbols of that country, The Na tree and the Nymphea Stellata, which is a blue water lily, and together with these is the Nestorian Cross. The top panel contains the dove as the Holy Spirit with a halo, with the flowering branches of the Na tree growing outwards from it. Central above the door is the Nestorian Cross which leads upwards into a fountain. From this centre flow rivers, the water of life, which then descend in four columns of flowing water at the base of both doors, to pools where the water lilies are. The water is a medium for binding the designs together to make a complete picture. Denoting purity, the Na Tree has both religious and sacred associations in Sri Lanka. It provides a very hard wood which is used for woodwork in the temples. It bears large, white, sweet smelling flowers and the edible seeds are used in medicines. The water lily (Nimamel) is also used in herbal medicines and is considered to be a symbol of purity and truth.